US equities have swiftly recovered all of their BREXIT declines, and considering ongoing price action, it would now seem probable that the sp'500 will do what was recently unthinkable, and break 'up and away' within days. The US market remains the world's strongest, and now looks set to lead other markets higher across the rest of the year. 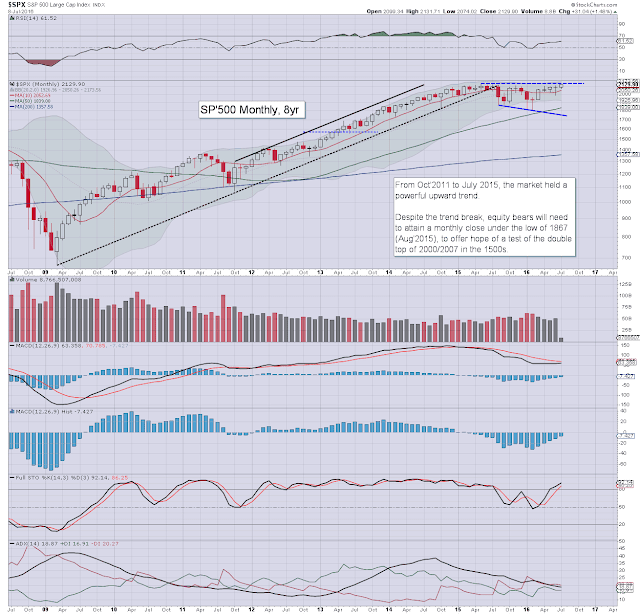 The Friday close of 2129 was a mere 5pts (0.2%) shy of the May 2015 high. Considering ongoing bullish price action, a break to new historic highs looks probable. If correct, it will argue for what remains of the 'broadly bearish outlook' to be dropped. 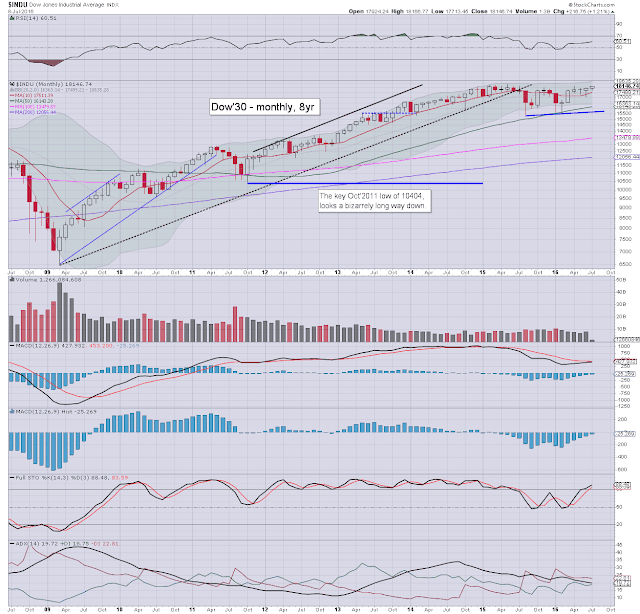 First upside will be the 2150/70 zone, where the upper monthly bollinger is lurking. 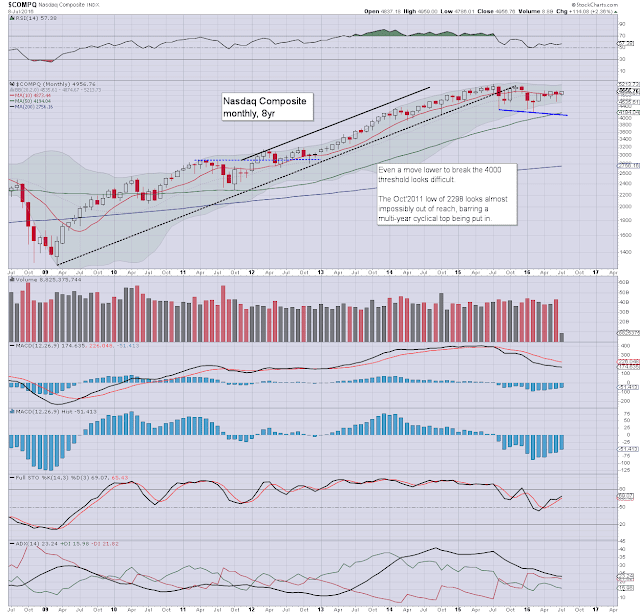 A move into the 2200s looks out of range until late Aug/early Sept. Underlying MACD (blue bar histogram) cycle remains negative, but looks set to turn positive, with a bullish cross in August. Such a technical event would be highly suggestive that the market is in the early phase of another multi-month/year wave higher. The Nasdaq is making a clear play for the giant psy' level of 5K. Any daily closes >5K, will bode for a continued run to challenge the July 2015 high of 5231. Any monthly close in the 5300s would give clarity of much higher levels into the 6000s by spring 2017. 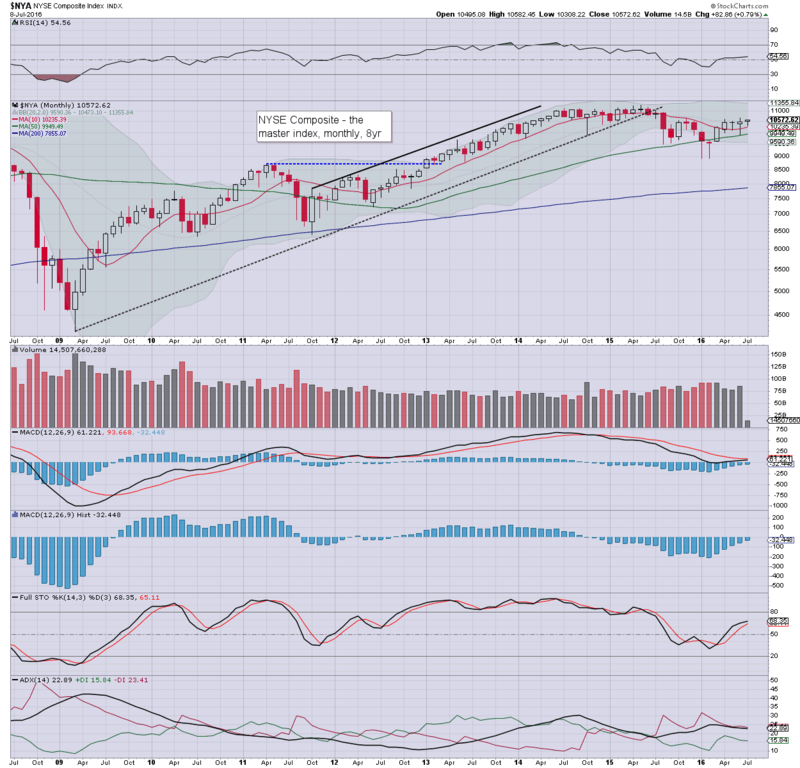 The mighty Dow managed a weekly close back above core resistance of the 18K threshold. The Dow is currently net higher for a sixth consecutive month, the best run since mid 2013. Underlying MACD is very close to turning net positive. 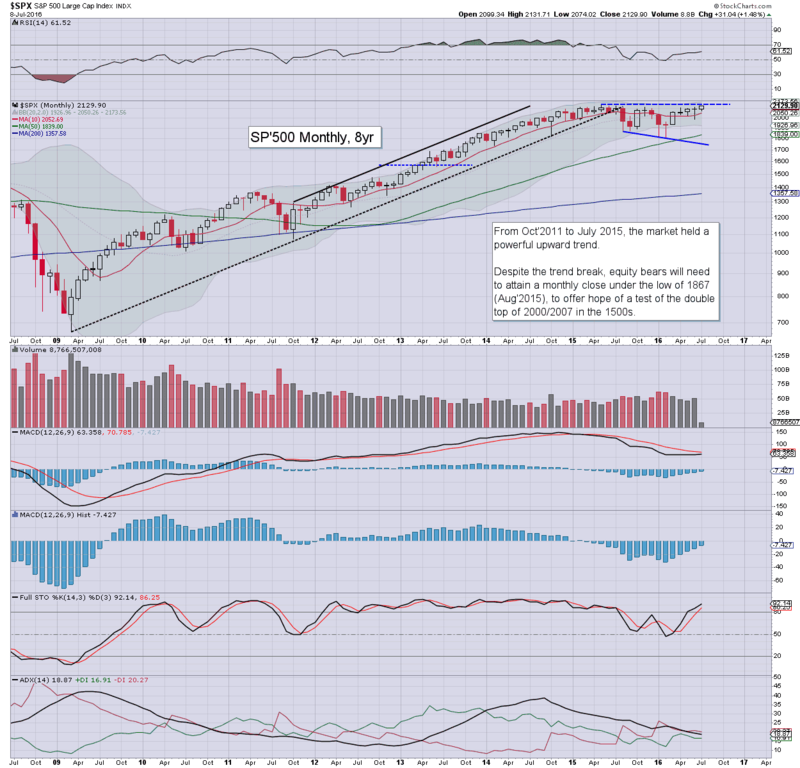 A break above the May 2015 high of 18351 will offer 18700/800s by late Aug/early Sept. 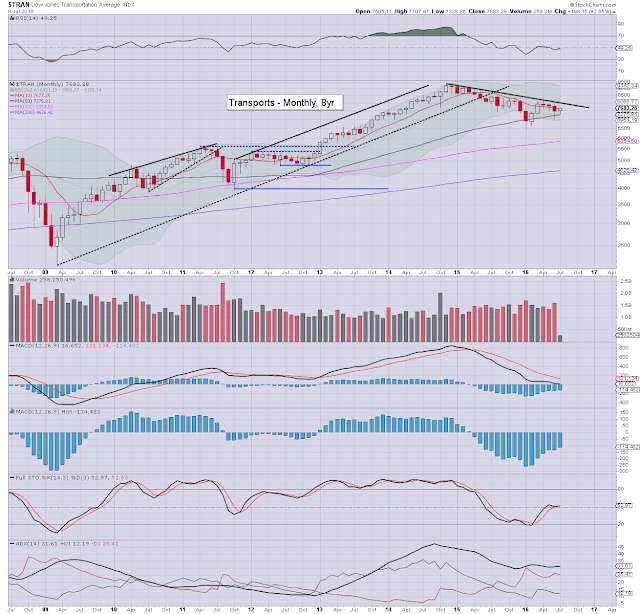 Even the most bullish outlook would struggle to see 20k by year end. 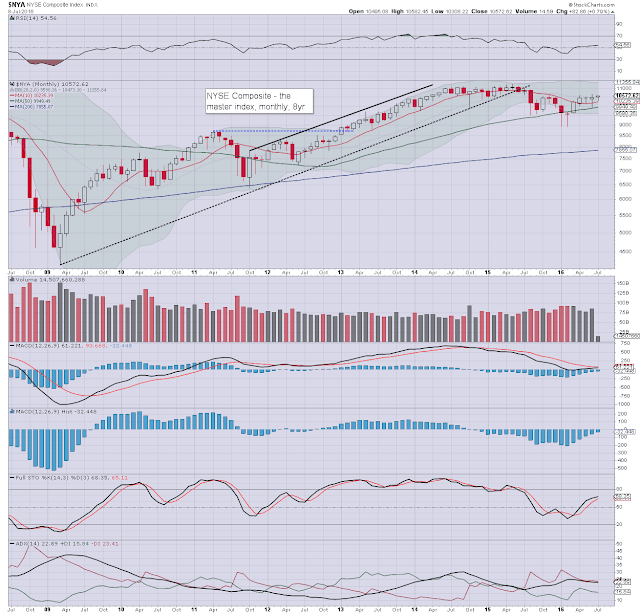 The master index is currently net higher for a fifth consecutive month, with a notable weekly close in the 10500s. 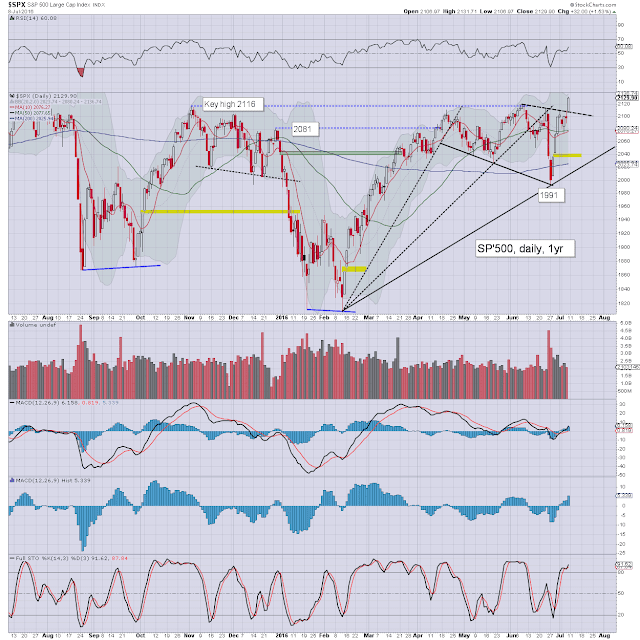 Next resistance is 11k, which is a clear 4% higher... equiv' to sp'2190/2210. The second market leader - R2K, is holding above the key 10MA, and looks set for an attempt to break back into the 1200s. However, this is still a long way (around 8%) below the June 2015 high of 1296, and will likely take at least 3 months. The 'old leader' - Trans, remains the weakest US index, currently in the 7600s, a considerable way below first resistance of 8K. 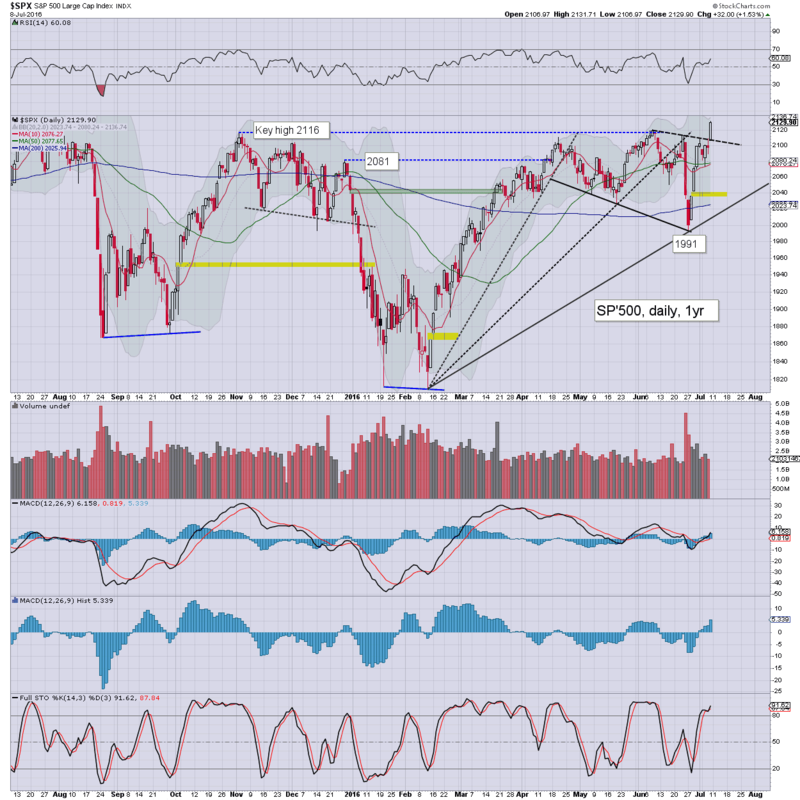 The Nov' 2014 high of 9310 is a very significant 21% higher, and looks out of range until around the start of 2017. 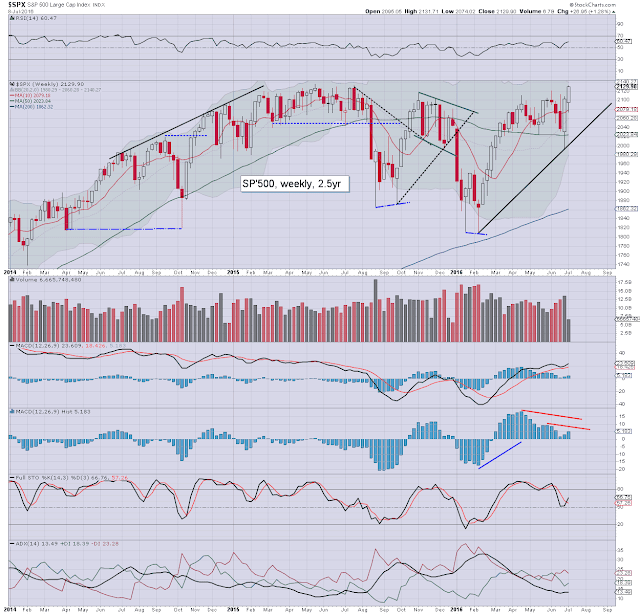 All US indexes continue to battle broadly upward from their Jan/Feb' lows. 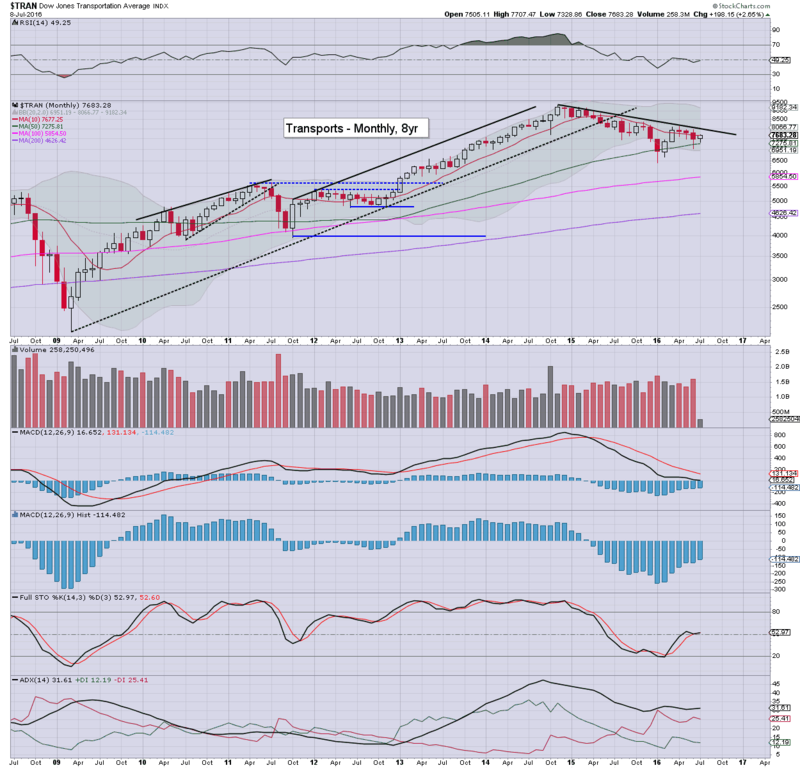 The sp'500 is leading the way, followed by the Dow and Nasdaq. Even if the 'headline indexes' break new historic highs in July/August, it will take the 'two leaders - Trans/R2K, a good 3-6 months to break similar new highs. *there are an absolute truck load of appearances from Fed officials. The Friday close of sp'2129 is clearly not a new historic high, but current price momentum sure does suggest a straight forward gap higher next Monday >2134. We could certainly fail from current levels, but after the past few days, its looking unlikely. 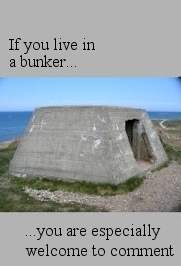 Despite the name, I can trade on the long side. If sp>2134, that will rule out any shorts for some months, and I'll merely seek to trade some quality stocks. Q2 earnings season begins next Monday with Alcoa (AA), and there should be some interesting trading opportunities across the next few weeks. 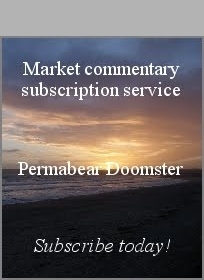 If you have valued my posts across the last four years, you can support me via a subscription, which will give you access to my relentless intraday postings. ***I am updating the page template and other things this weekend. US equity indexes ended the week on a very positive note, sp +32pts @ 2129 (intra high 2131). The two leaders - Trans/R2K, settled higher by 2.5% and 2.4% respectively. 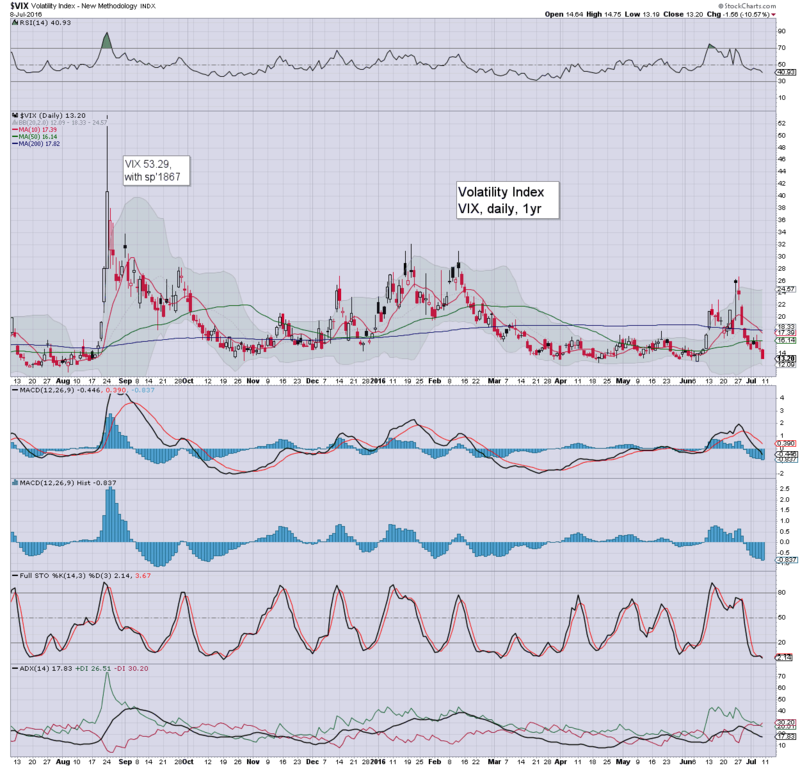 VIX settled lower by -10.6% to 13.20. Near term outlook offers sp >2134 to new historic highs, with other indexes set to follow. With the jobs data pleasing Mr Market, equities built solid gains across the day. 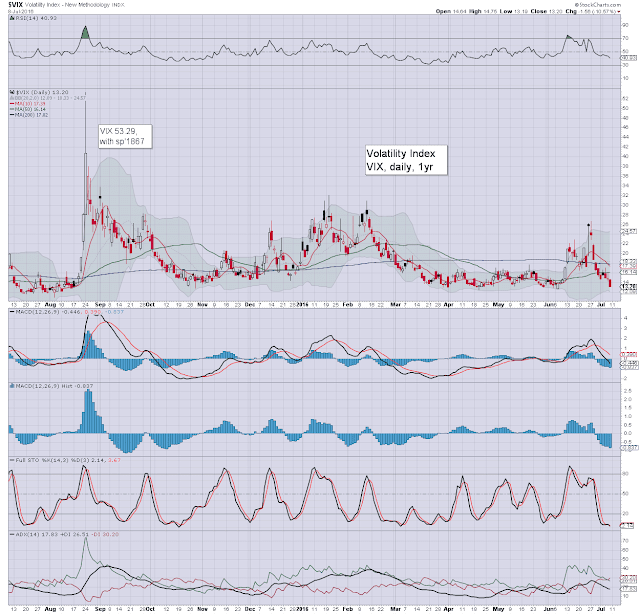 VIX was naturally crushed to the 13s... having now been cut in half from the BREXIT high. re: the jobs data. So, May was revised to an even lower 11k net gain, whilst June is initially at 287k. Seriously, are the BLS using a random number generator lately? Regardless, the market was pleased, and it made for a very bullish end to the week. 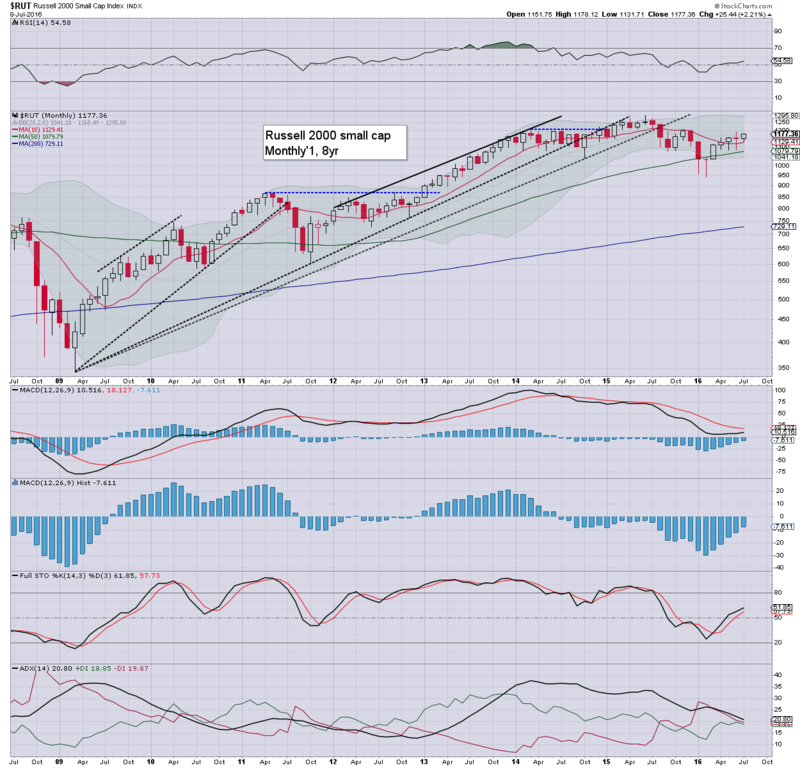 After a second consecutive net weekly gain, it would seem that rather than another failure, we'll see the sp'500 break a new historic high at next Monday's open - or at some point next week. The Dow and Nasdaq will duly follow, with the Trans/R2K set to take 3-6 months to also break new historic highs. US equity Bears had their opportunity with the recent BREXIT vote, but failed to even attain a daily close under sp' 2K. The precious metals and US bonds continue to broadly climb, but that is not enough to negate the fact that the sp'500 is set to break above the May 2015 high. So.. yes... yours truly has waved the white flag.